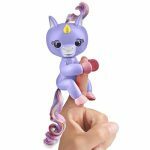 Fingerlings Baby Unicorn - Gemma (Pink with Rainbow Mane and Tail) — Deals from SaveaLoonie! Gemma is a magical pink Fingerlings Baby Unicorn that loves to hold onto your fingers! Magical interactive pet responds to noise, motion, and touch with blinking eyes, head turns, and a variety of cute noises. Blow Gemma a kiss and she will kiss you back!